VIENNA - Whole-body MRI screening is safe and accurate for detecting serious pathology in the asymptomatic general population -- especially in patients older than 50, according to a study presented on Sunday at ECR 2014. A few findings were more prevalent than expected in individuals younger than 50. Brain infarcts, for example, were found in nearly 40% of individuals older than 50 and in 19% of those younger than 50, according to researchers from the Medical University of Warsaw and the city's Medicover Hospital. Brain gliomas, hemangiomas, renal carcinoma, significant degenerative spine disease, and pulmonary nodules were also found in significant numbers among the patients scanned at the hospital over approximately three and a half years. Dr. Andrzej Cieszanowski from the Medical University of Warsaw. Whole-body MRI is a good tool for investigating the general population because it has excellent soft-tissue contrast, good spatial resolution, and no ionizing radiation, as well as reasonable sensitivity and specificity, said radiologist Dr. Andrzej Cieszanowski from the Medical University of Warsaw. "Additionally, we could use this technique to assess the prevalence of abnormalities in the general population, in different age groups, and we hope that it could give us some insight into the natural history of some lesions," he said. Still, MRI has its shortcomings in such a setting, including a substantial number of incidental findings without clinical significance, which may lead to additional exams, follow-up, biopsies, and interventions and even psychological distress for well patients, Cieszanowski said. 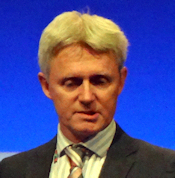 "There's also no evidence for the usefulness of such imaging in terms, for example, of patient survival," he added. The study aimed to assess the incidence of abnormal findings detected during noncontrast-enhanced whole-body MRI (WB-MRI) in the general population in two age groups: individuals younger and older than 50. 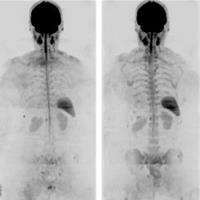 The MRI exams were performed on a 1.5-tesla scanner between December 2009 and April 2013 in a private hospital. The older-than-50 group included 215 patients with a mean age of 57.9 years, while the 50-and-younger group included 451 patients with a mean age of 40.9 years, according to Cieszanowski. 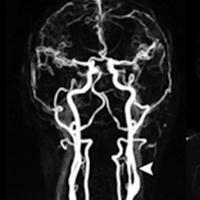 Two experienced radiologists evaluated the data retrospectively, blinded to the patients' clinical data. They divided the findings into three categories: type I, meaning low significance and not requiring further follow-up or treatment; type II, a finding of moderate or potential significance that might require follow-up or treatment; and type III, a significant or potentially significant finding that requires treatment or immediate follow-up to determine the nature of the finding. The results showed 3,375 incidental findings in 659 (98%) of the subjects. These included 2,997 type I lesions (88.8%), 363 type II lesions (10.8%), and 15 type III lesions (0.4%), including nine lesions in seven patients that were malignant or possibly malignant. 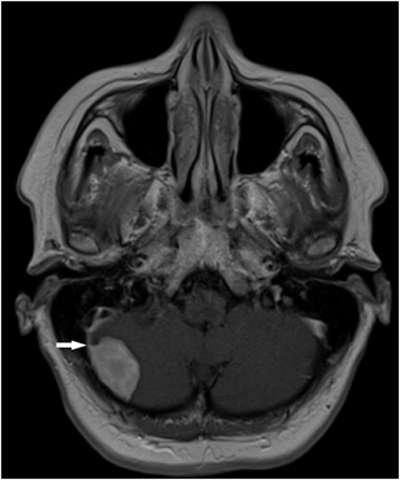 Meningioma seen at whole-body MRI in a 43-year-old man who underwent surgery. Image courtesy of Dr. Andrzej Cieszanowski. Type III findings included one brain glioma, one bronchogenic carcinoma, one renal cell carcinoma, one complicated renal cyst, one ovarian tumor, one testicular Leydig cell tumor, and metastases to the lung, liver, and adrenal gland in one patient, Cieszanowski said. Benign lesions classified as type III included a meningioma. All type I lesions were more common in older patients, with the most pronounced differences seen in the number of brain infarcts (19% ≤ 50; 39% > 50), thyroid nodules (8.4% ≤ 50; 20% > 50), significant degenerative spine disease cases (22% ≤ 50; 47% > 50), and renal cysts (16% ≤ 50; 43% > 50). Among type II lesions, significant differences in prevalence between individuals 50 or younger and those older than 50 included cases of hepatic steatosis (16% versus 25%, respectively), gallstones (3.2% versus 7%), and uterine fibroids (16% versus 38%). As for study limitations, the subjects were not selected randomly, and there were more individuals in the younger age group than in the older one, Cieszanowski said. The patients were recruited through a private health insurance firm, which reflected the better material status of these patients, he said. "And the presence of the majority of findings was not confirmed; therefore, we could not assess the number of false-negative cases or the sensitivity of our technique. Only type III and some type II lesions underwent comprehensive assessment." Based on previous studies, the imaging protocol probably allowed the adequate evaluation of many organ systems; however, it "did not allow a detailed assessment of the cardiovascular system, joints, neck, or prostate -- except for the exact assessment of its size," Cieszanowski said. Noncontrast whole-body MRI is an accurate and reliable method of detecting disease throughout the body, including malignant tumors, he concluded. "All of our findings were more common in individuals over 50 years of age; however, some of our findings were present in significant numbers in subjects below 50 years, including brain infarcts, degenerative spine disease, hepatic cysts, hemangiomas, and renal cysts," Cieszanowski said. "We hope that in the future similar analyses performed on larger numbers of patients could facilitate a better understanding of the natural history of some abnormalities," he added.